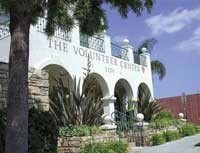 Remember our October Can Opener Drive: Thanks to you, we donated 76 can openers to The Volunteer Center of South Bay Harbor. We were recognized by them for our donation in their newsletter and web-site. 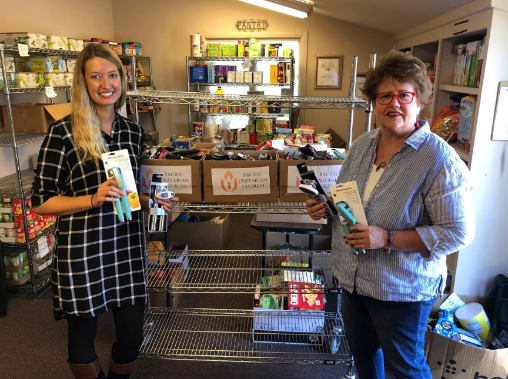 Here, captured in the act of donating is our own Lora Childres and Volunteer Center Volunteer Coordinator Trisha Smith. Down the road we may do a drive for the Volunteer Center’s Food for Kids program, that sends home a bag of food with kids living with food insecurity, so their family has food for the weekend. However, likewise on Thursday Dec 20th we are going to continue our tradition of Holiday giving with our participation in LA’s Holiday Food Program titled “One Voice” up in Santa Monica at Barker Hanger on 3021 Airport Ave. This massive event runs from 7:30 pm to 9:00 pm, but those who want to car pool can meet at church at 6:00 pm to make the trip with Rev. Steve and others. Although it is a little late, this is a family friendly event. Expect lots of music. Lots of hustle, but also lots of fun. More importantly, it is a kid friendly event. Still unclear on what “One Voice” is? 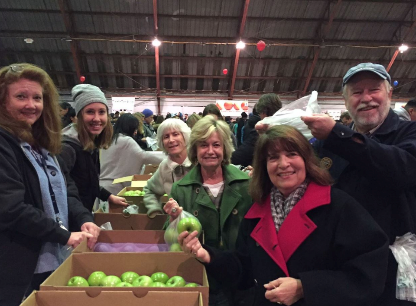 Imagine hundreds of psyched volunteers packing food for Head Start families in a bustling airplane hangar. For more information check out the One Voice. Seen above are members of our 2016 coalition of volunteers to this event.